Janie's Pocono Mountain Garden: Two Turtle Doves ... And A Cat In A Christmas Tree! Two Turtle Doves ... And A Cat In A Christmas Tree! 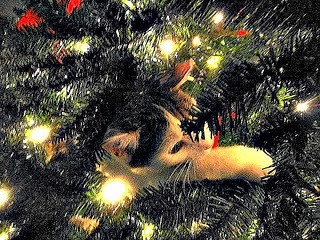 Cats and Christmas trees. In them. Under them. Behind them. If you have a cat, or ever had one ... you'll understand. Bobcat. I'll never forget his first encounter with our Christmas tree. I can still recall watching in horror when he suddenly lunged at the tree and then scaled it like he was climbing Mt. Everest. He quickly chose a cozy spot deep within the tree's branches to snooze and while away the hours. There was no coaxing him out. Yet, he didn't disturb a single strand of lights or break a single ornament. This photo is a lasting memory of a feisty kitten who had brightened our lives, though it was only for just a few short years. Now, our sweet girl, Dixie, was nothing like Bobcat. She was content to just quietly lie under the tree. We shared 14 Christmases with her. This year is our first Christmas without her, and we miss her terribly, but we know she is with us in spirit. Hey, do you have any cat or dog tales you want to share? Maybe you have a dog that likes to pee on your Christmas tree? Please share in the comments below! Oh my goodness! Patch's nose looks just like a Christmas tree!!! 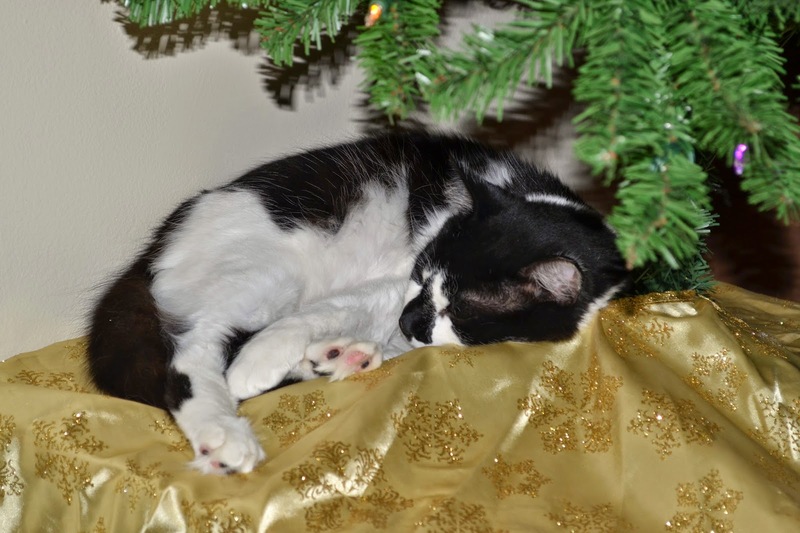 Our kitty, Roger is celebrating his 11th Christmas this year, and like your Dixie he is content curled up under the tree. It's almost as if he's glad we finally got his tree up again each year. This is our first Christmas with our golden retriever puppy, Sonny who is almost 1. Surprisingly he has left the tree alone, following the lead of his big brother Duke, our beloved 5 year old mutt. I hope you and your family - fur baby included, have a wonderful holiday season!